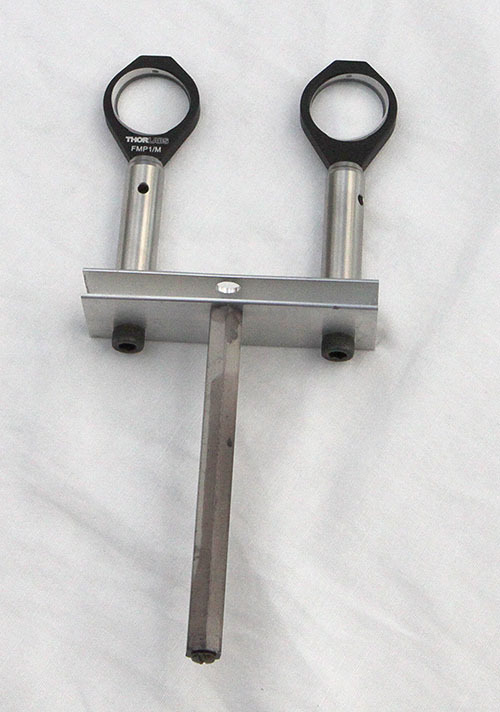 The device illustrated on the pictures below is a double periscope mounted horizontally. It is used to look at paper printed side by side images for 3D effect. Each periscope is built with 2 mirrors, a small and a large one. The small mirror is a 75 by 75 mm front surface mirror, the large one is also a front surface mirror with dimensions 200 X 170 mm. To reduce the cost, the large mirror could also be an ordinary back surface. The distance between the center of the back mirrors is 30 cm, the small mirrors are separated by the normal inter eyes distance, generally 65 mm. The mirrors positioning should be adjusted by laser. The size of the pictures which can be looked at with this device is limited to 30 cm horizontally. Vertically it could be between 20 and 24 cm. The mirrors and their holders are coming from Edmund Optics. Above, the front view of the stereoscope. The head is positioned between the black panels, looking through the small mirrors. As can be seen below, the large mirrors are mounted on larger black plastic panels to prevent spurious light reaching the eyes. 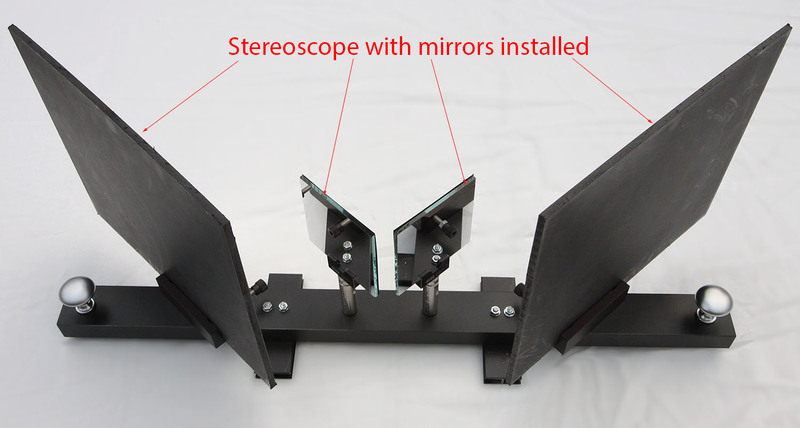 Prism stereoscope. Two 6° prisms are mounted and adjusted with a small laser. Side by side images can be seen in 3D on a PC monitor screen. The size of the pictures and viewing distance should be adjusted for comfortable seeing. This device is used to see the 3D minerals structures from the site webmineral.com. The mechanical and optical components are from Thorlabs.